The UCI Road World Championships Elite Women’s Road Race took place this past Saturday, September 22 in Limburg, Netherlands. After taking the silver medal for the past five UCI Road Worlds, Marianne Vos (Netherlands) was on a mission to claim the rainbow jersey this year. 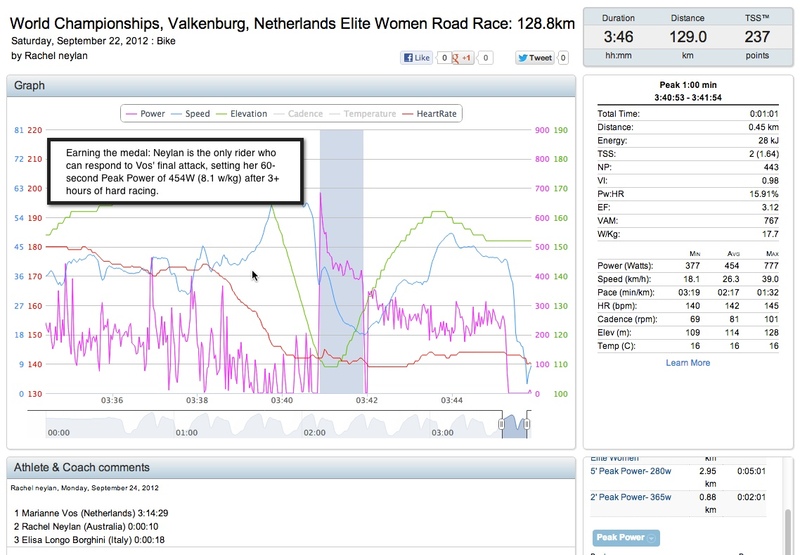 The Elite women completed 128 km (79.5 miles) in eight 16-km laps, with 2 climbs on each lap. Vos crossed the line alone after launching a vicious attack on the final ascent of the Cauberg. Rachel Neylan (Australia) and Elisa Longo Borghini (Italy) finished 2nd and 3rd, respectively. Neylan, of the German-based Abus Nutrixxion Team, was gracious enough to share her silver medal power file with us. 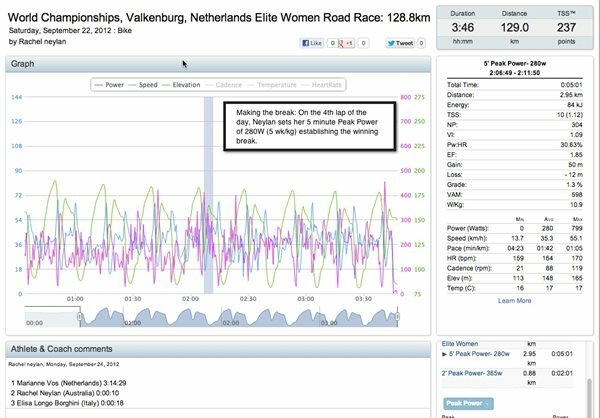 We asked TrainingPeaks Customer Education Specialist Shawn Heidgen, a former pro cyclist and coach herself, to pull out the key moments during the race that solidified Neylan’s spot on the podium. 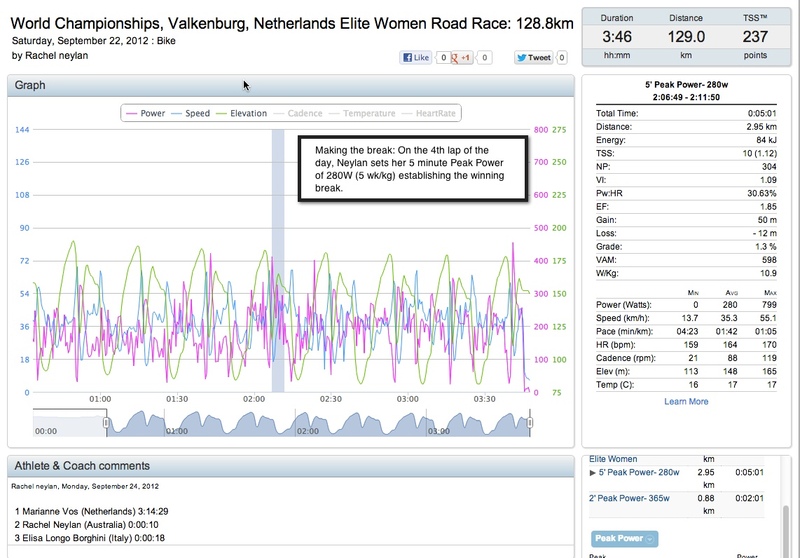 See Rachel’s full TrainingPeaks Activity Viewer here. Splitting the race into two 63 km (39 mile) halves, we can see that the second half of the race was much harder than the first half despite the fact that Neylan had to fight to make the break during the first half. During the first half of the race, she averaged 169W (3.3 w/kg) with NP of 209W and energy expenditure of 997 kilojoules. In the second half, Neylan averaged 197W (3.8 w/kg) with NP of 231W and spent 1141 kJ. Shawn'Heidgen has been involved in cycling for over 20 years. She raced professionally for three years during which she completed 2 Giro D'Italia Donne (Women's Tour of Italy ) and competed on the National Race Calendar circuit. 'Shawn'has also coached cyclists of all abilities for many years, and has led and directed training camps all over the world. Learn more about Shawn on alpcycles.wordpress.com, her coaching partnership with NCC Criterium Champion Alison Powers.